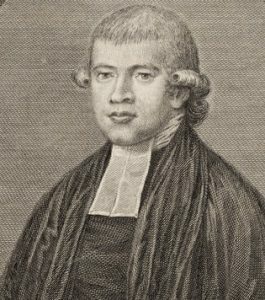 The Rev Richard Johnson was a Church of England clergyman who served as chaplain to the colony of NSW from 1788 to 1800. He was also a successful farmer at Canterbury Vale and Ryde. The word ‘glebe’ dates back to Middle English and was used to represent a piece of land belonging to the Church and lent temporarily to a member of the clergy to provide income. In 1790 Governor Arthur Phillip granted Richard Johnson, as Chaplain to the colony, four hundred acres west of the Parramatta road as a potential farm site. The word ‘glebe’ was later adopted as the name as the suburb, Glebe, which includes this original land grant. Without adequate assistance to clear the land Johnson found little use for the glebe, and in a letter to the Society for the Propagation of the Gospel described it as “400 acres for which I would not give 400 pence”. Max Solling states that early maps suggest that land near the corner of Glebe Road and Mitchell Street was cleared by Richard Johnson in the early 1790s as he endeavoured to cultivate his land. However, he was more interested in his own land grant which he named Canterbury Vale, and which he worked successfully.